Most of us have found the intuitive understanding within us that we are first and foremost spirit beings. Spirit is the artist behind existence, without this inescapable connection to spirit, we could not be operating in these bodies. 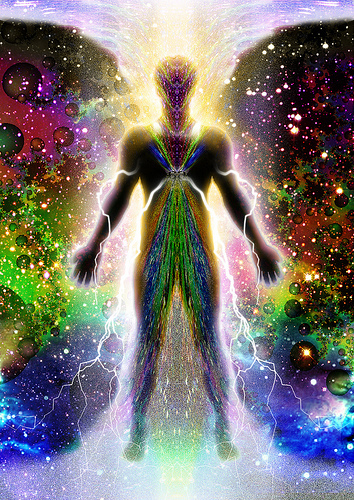 The body and spirit work together, to make a very intelligent creature full of power, flare, flavor, and creativity. It’s a very divine marriage we embody. But day after day, we get so used to waking up in this body we see, that we ignore the silence behind the body, we see past the spirit. Some of us have also lost the passion behind our decision to be in this body – and the recollection that we chose this experience from the highest of perspectives. This is not a curse; but an defining experience that we wanted. This week I’m going to do a little less writing and take you into a meditation where we can mentally separate the body and spirit for a moment, to dis-identify with our physical problems and worries, to soften the strain that attachment may have on us sometimes. So that we may remerge the two perspectives together again, awakening into a deeper understanding and memory of the marriage that we chose – the spirit body marriage. I was just thinking about this theme recently. Loved the meditation, thank you!